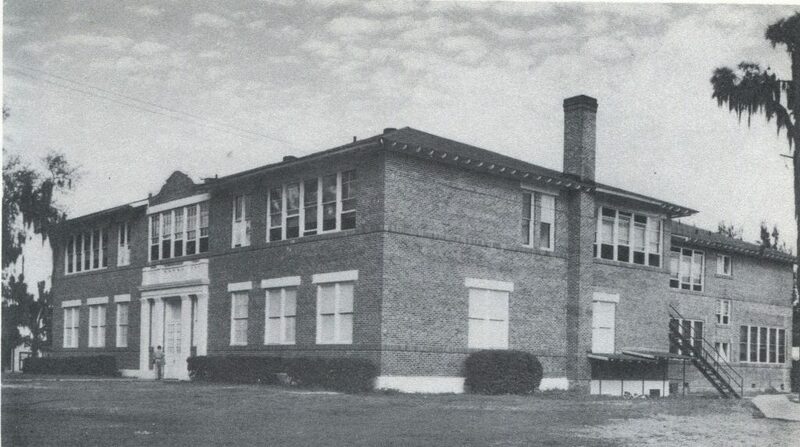 Auburndale’s first official school opened in 1890 in a building on the corner of Main Street and Bridgers Avenue. Education for grades one through eight was offered, and less than 40 students were enrolled in the school. By 1895 the city had the southernmost library and free reading room in the United States, adding culture to the city. The first building officially constructed as a classroom was built in 1915 on the site that is now Stambaugh Middle School. A second building, built in 1925, included the addition of an auditorium that was used by the city for cultural events until 1979. By the late 1940s Auburndale was a growing community and its population was outpacing the capacity of the local schools. Auburndale Central Elementary opened in 1947, taking 1st through 6th graders. The high school, housed in a 1925 building at the present location of Stambaugh Middle School, was to have a six-classroom addition placed adjacent to it while a new high school was built up off Lake Ariana. Construction started in 1953 and the new campus was finished for the 1954-1955 school year. 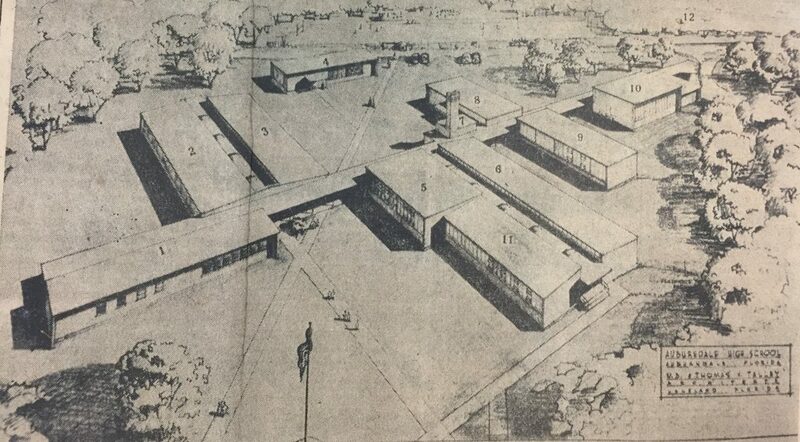 The new AHS campus, in its present location, featured an administration building, four classroom buildings (original 30s, 40s, and 70s halls), an industrial arts facility (original 50s hall), library, heating plant, PE locker rooms, home economics building, and cafeteria. The Auburndale High School band needed a facility, as a teacher from Florida Southern College had organized students that played instruments in 1945. The band building was added to campus a few months into the 1954-1955 school year. As of 2017, the only buildings from the original campus still standing are the heating plant/PE locker rooms (ROTC rifle range) and industrial arts facility (500s building). 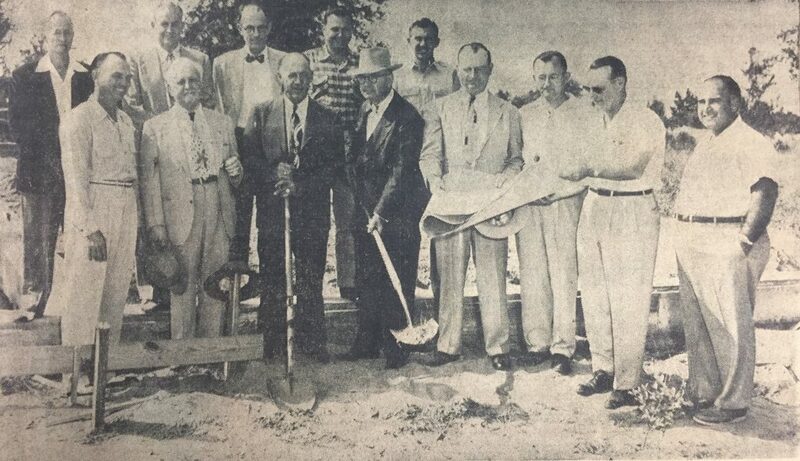 Groundbreaking ceremony of the new AHS, 10/26/1953. Click for more info. Newspaper articles from the time stated that despite this new campus being built, there were fears that it wouldn’t be big enough. “The two [classroom] buildings will help, to some extent, relieve congestion, but school officials pointed out that with the ever-growing school population, further construction in Auburndale will be necessary… [the new school] will accommodate 450 students in 14 classrooms.” (Auburndale Star, 5/13/1954) By the end of the 1950s, another academic building (original 20s hall) had been added, near the site of the present-day cafeteria. This had an extension added in 1968, which split the building into two levels. 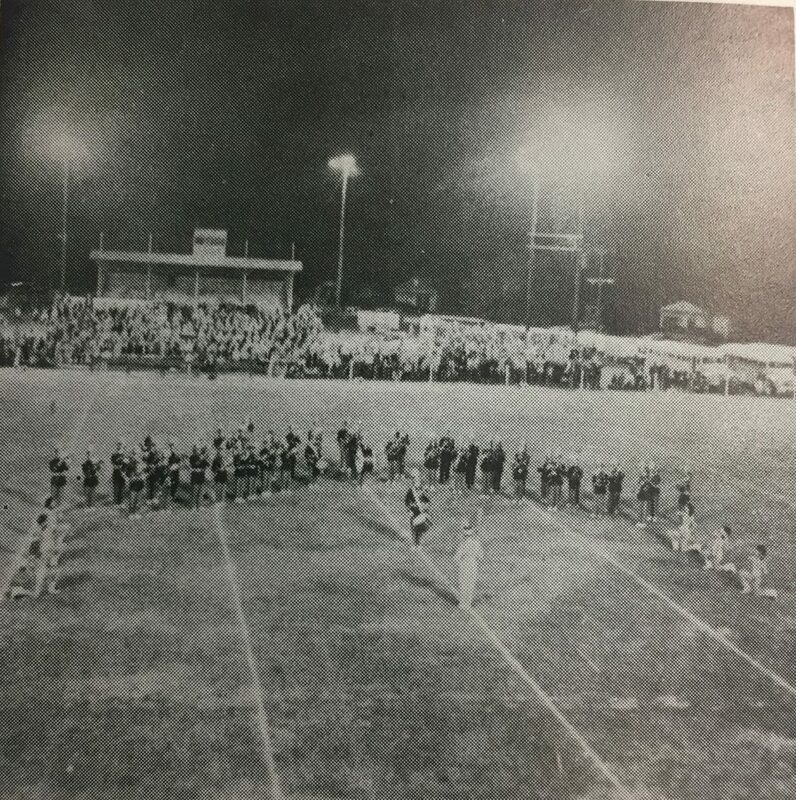 The high school football team had played on poor fields throughout the 1940s, until a deal with the city of Auburndale led them to adding lights and bleachers to Connie Mack Field on Highway 92 to make it playable for the Bloodhounds. The first football game played there took place on October 16, 1953. They continued to play at Connie Mack Field until work was started on constructing a stadium for AHS; the Auburndale High School Citrus Bowl opened for the 1962 football season. It was dedicated and renamed for former longtime Auburndale City Manager Bruce Canova in November 1982. The absence of a school gymnasium proved problematic up until this point as the high school basketball team (having had both boys’ and girls’ teams since 1926) was forced to play its home games at the gym of the Junior High (the former AHS location, where Stambaugh is located now). The year 1966 saw that change as the AHS gym was completed. Over fifty years old, the gym has seen several district champions, hundreds of pep rallies, and thousands of sporting events. The gym underwent some work in 1987 with the additions of the present-day wrestling room, storage, and offices. The lobby area of the gym was renovated in the late 2000s, with trophy cases moved and a concession stand added. The gym was named for NBA Hall of Famer and former Bloodhound Tracy McGrady in January, 2004. 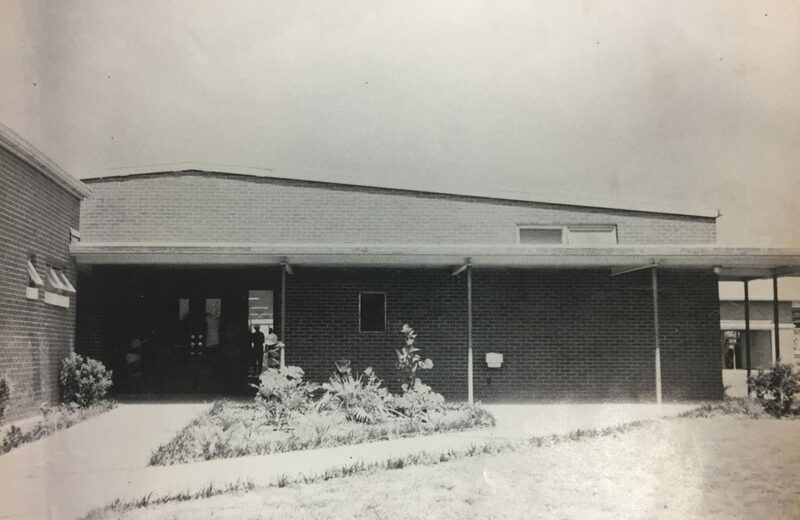 Concurrent with the construction of the gym in 1966 was the building of an agricultural facility; the first AHS ag program was started in 1951. This building was replaced with a new Ag building in 2002 as the original building was renovated and turned into PE locker rooms that same year. By 1967, the need for a new library on campus was evident and construction started on a state-of-the-art circular building at the top of Prado Street off Lake Ariana. This circular building was completed for the start of the 1968-1969 school year, and books were brought from the former library’s location which was very close by. The former library (40s hall) would eventually house the ROTC cadets, then the social studies department. The new facility housed the library until 1989 when this circular building was renovated and turned into an art center. The art center was named for Bloodhound alumnus and noted artist Robert Stackhouse in 2008. The year 1973 saw some shuffling of Auburndale schools. Auburndale Junior High School, at this point located where present-day Stambaugh Middle School is located, was over capacity, necessitating a new facility. This new building was built at the north end of the AHS campus, and 8th and 9th graders attended. The former junior high was rechristened as Auburndale Middle School. The afternoon of May 8, 1979 saw a tornado rip through Auburndale, absolutely destroying the middle school buildings. This caused the eventual completion of Stambaugh Middle School, in the same location, opening for the 1984-1985 school year. Further expansion was necessary in the early 1970s, and another two buildings were built in 1974. What was then known as the 10s hall (now 100s) was constructed, housing science labs. A new building (part of the original 70s hall) was also built adjacent to the cafeteria on the southern part of campus. By the early ‘80s, the band building at the far south end (present day bus loop) was outdated, as was the woodshop (present day 500s building). Two new buildings were built in 1982 to replace those old ones; these two buildings flanked the old cafeteria. The band building would host the Imperial Sound of Auburndale until the early 2010s, when it became the ROTC facility; the new industrial arts building would get renovated and become the state-of-the-art HDTV studio in 2012. The year 1984 saw the construction of another academic building, the 80s hall (now known as the 300s building). Also in that year, the old woodshop, part of the original campus, would be renovated and turned into a building for Diversified Cooperative Training and Distributive Education; this would eventually become the business building, now known as the 500s building. A new administration building was completed in 1986; this replaced the original administration building, which was converted into an art room and then storage. In 1989, the Auburndale Junior High School building, at the north end of the school, was absorbed into AHS. This brought freshmen into the school. This building, now known as North Campus, had been completed in 1973. For more information and photos, be sure to check the gallery below. The high school had been using the junior high’s auditorium for assemblies, but that changed in 1991 as AHS got its own auditorium. In 2010 a full music suite was added onto the auditorium, which allowed the band, orchestra, and chorus to move out of their building on south campus. The 1990s saw very little other work done on campus; the North Campus cafeteria was removed and converted to classrooms in 1998. The early 2000s saw another wave of construction, as a new agricultural building was built (Holbrook-Russell building) and the old one was turned into PE locker rooms (Dunson-Winsett building). North Campus had its own renovations during the decade, with its auditorium, cafeteria, and locker rooms removed for more classroom space. 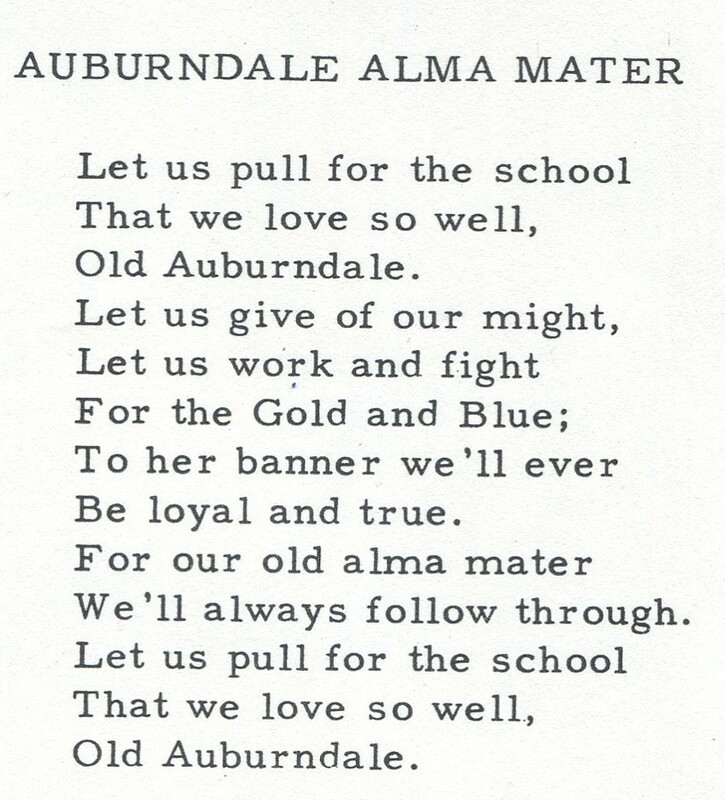 The year 2010 would prove to be the year where Auburndale High School got its new identity. A massive master plan was put into place; several buildings were destroyed; the 20s, 30s, 70s, cafeteria, and band buildings were removed. A new cafeteria and two new academic buildings replaced them, along with renovations to the North Campus media center, football concession stand, and softball locker room building. Upon completion of the project, the buildings were renumbered into their present hundreds format. Today, Auburndale High School is a flourishing school, offering a world-class education to students of the 21st century. Many administrators, teachers, and students have come and gone, and a multitude of organizations and sports teams have been added. The recent beautification and remodeling has ensured that this school which has already stood the test of time will continue to thrive and grow. The vision of the school, created by the students and staff of current Principal John Hill, has the same kind of lasting power. . .
. . . Creating an extraordinary environment that inspires greatness! If you have any information and/or pictures to contribute to this page, please contact Jake White.